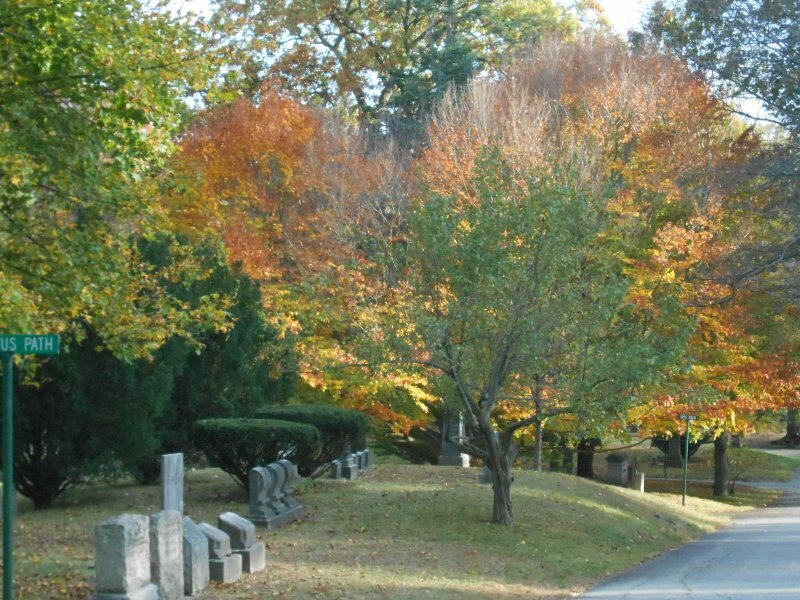 The weekend before Halloween, Yang and paid a visit to the Lowell Cemetery. 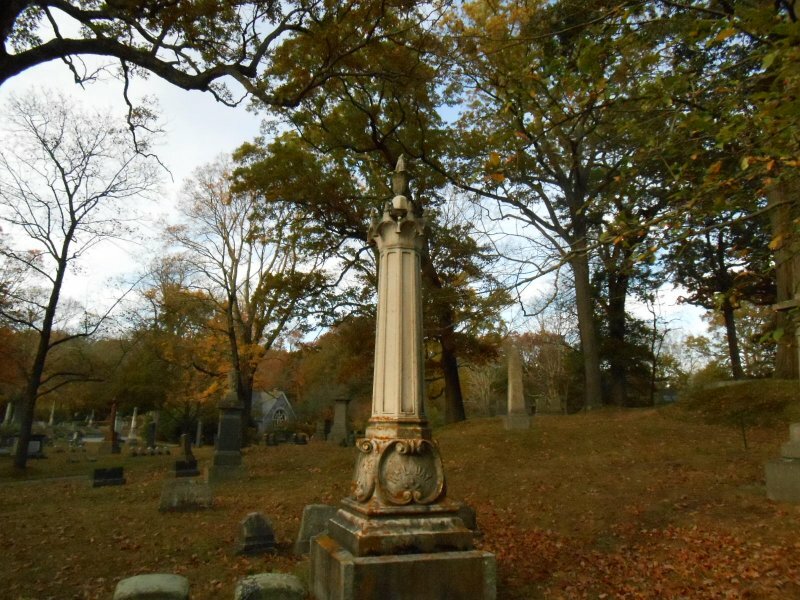 It isn’t the oldest burial ground in the city, but it’s probably the most Gothic, designed in the Romantic style, after Mt. Auburn in Cambridge, MA. 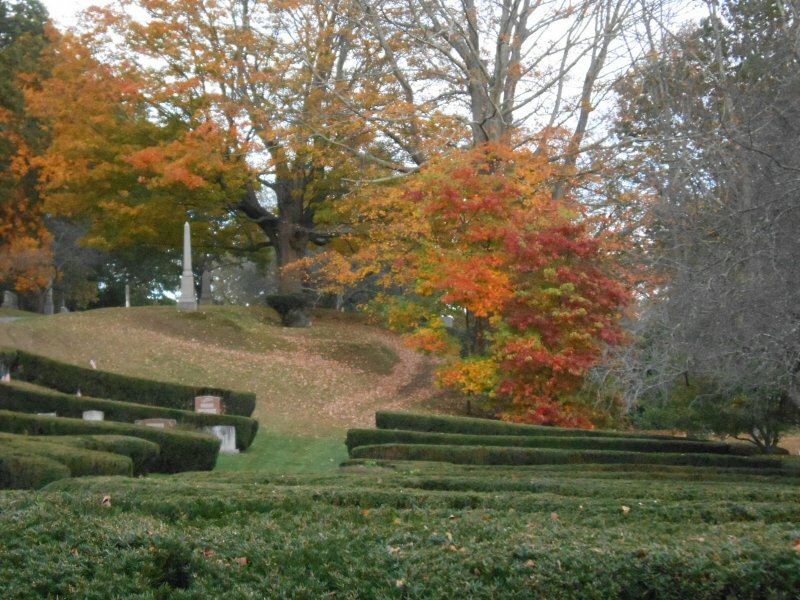 The fall colors were uneven in Lowell, as in most of central Mass. However, we were able to get some lovely background shots, as you can see here. 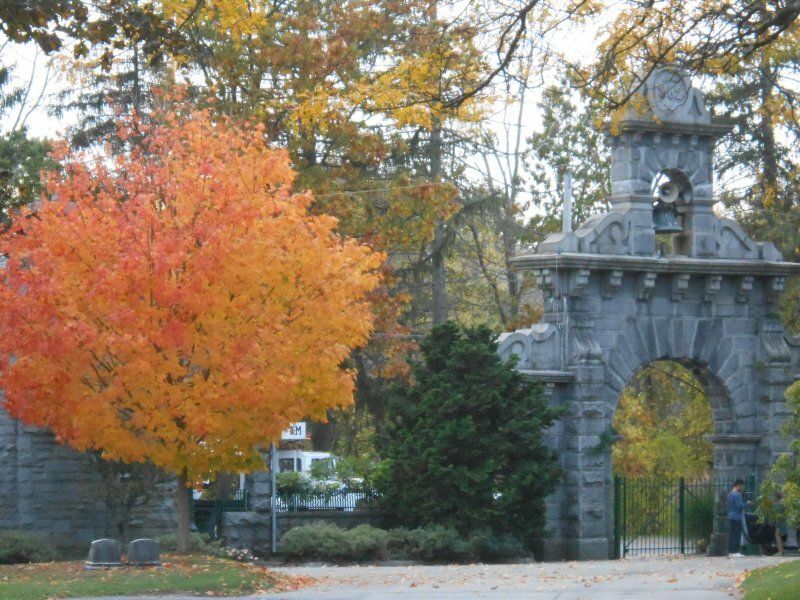 Yang took this photo of the gate and a beautiful sugar maple next to it, from the inside of the cemetery. The combination of fall colors and crypts and monuments made some wonderfully seasonable shots, especially since the cemetery has some unique and beautifully crafted monuments. I love the highlight the orange-flame gives to this crypt. 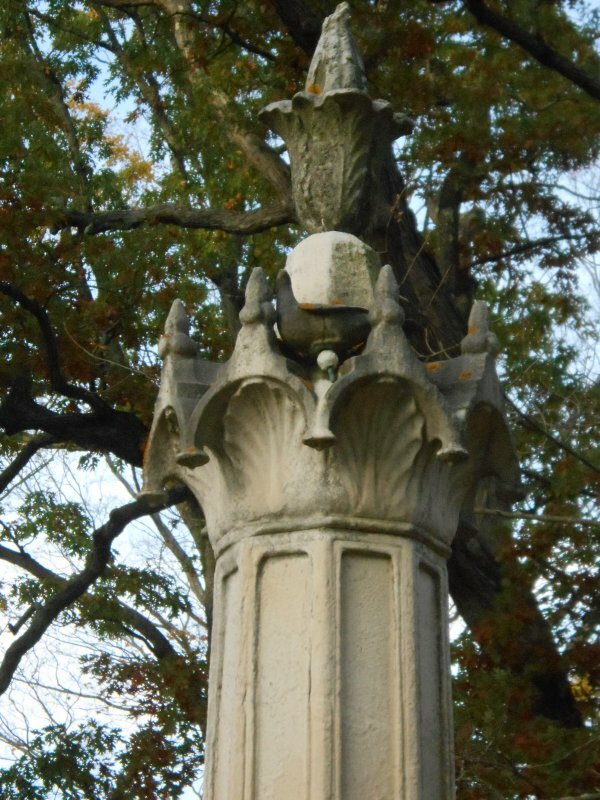 I was especially taken by this pillar topped with a kind of medieval church spire. The burnt oranges and reds of the scenery create beautiful surroundings in the amber autumn sunset. I was so impressed with the top of this monument, that I had to get a close up of it. Definitely reminiscent of something out of the High Middle Ages. Of course there were also some shots of the trees that were absolutely enthralling, too! I was particularly taken with this relief carving of an angel ministering to penitent soul, on a stone nestled by a green pine against a background of soft orange and golden foliage. 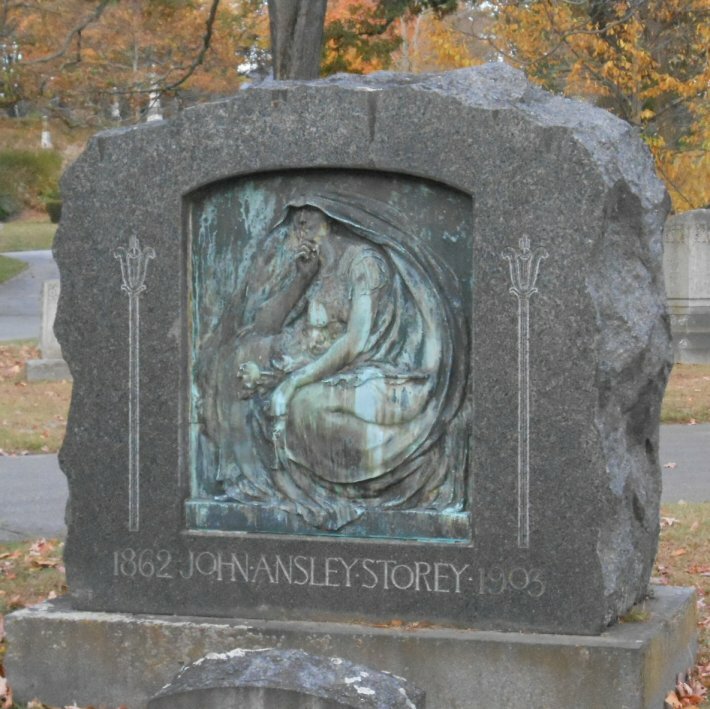 The relief carvings were some of the most striking and beautiful monuments that we viewed in the Lowell Cemetery. One of the first ones that I noticed was of this angel presiding over the tomb with a cross. Like many of the statues and monuments, it revealed its antiquity by the way mold, lichen, and moss had blurred its features. 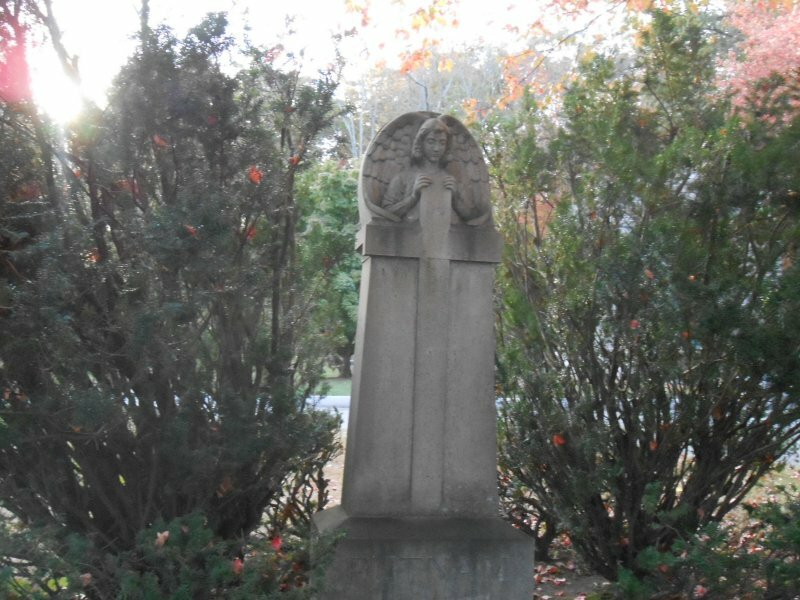 I love the way the sinking sun lends an gleam of divinity over the guardian angel. 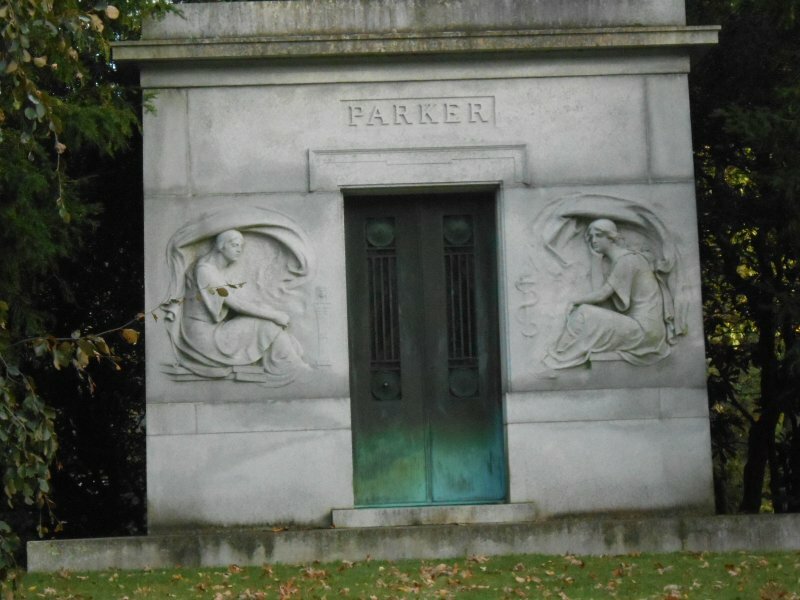 The Parker crypt is guarded by two figures carved on either side of the entrance. I’m not sure who or what the two figures represent beyond sorrow at death. 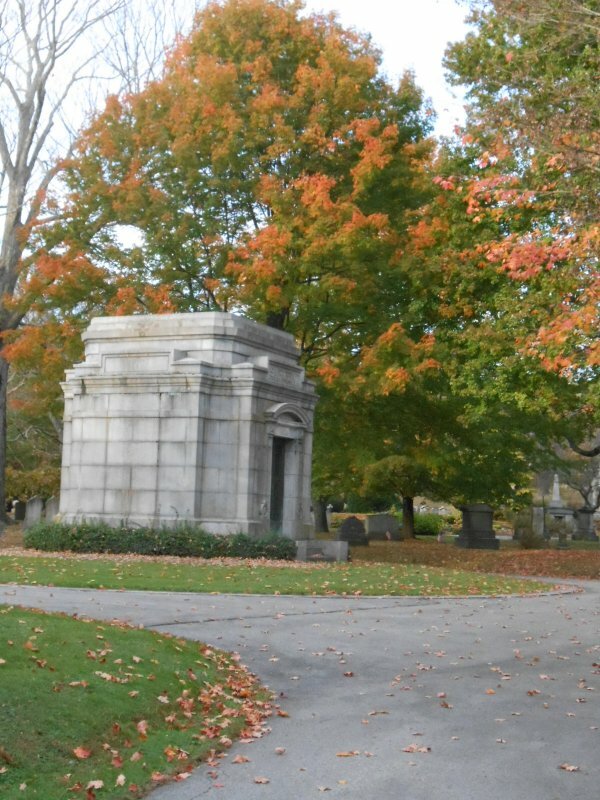 Since we have a major thoroughfare in Lowell called Parker Street, and this tomb is on the elaborates side, the family must have been quite a powerful one in Lowell. No one named Ben, May, or Peter was listed on the site. This stone combines media, stone and bronze. 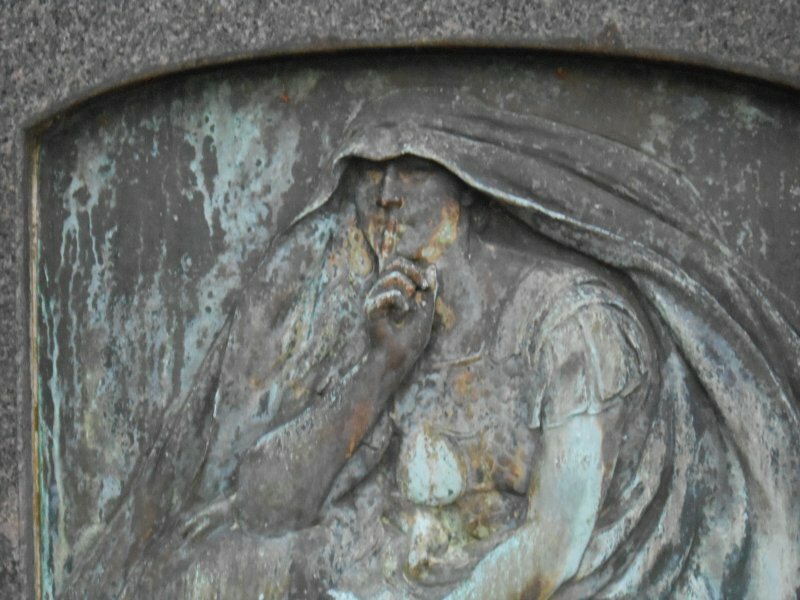 Does the figure represent Death or Fate, quieting our questions and fears about what comes next with a finger to the lips. I’m not sure if the form is male or female. It’s more solemn than reassuring – a sober warning to the living that no secrets, hopes, or words escape from those who’ve passed beyond this vale of tears – or vale of soul-making if you’re into Keats. Or maybe even this is a warning to give up asking questions when you enter into a realm beyond thought and languages as we know them. Perhaps a close up will help us better read the warning of this eerie being, shroud ethereally encircling it. 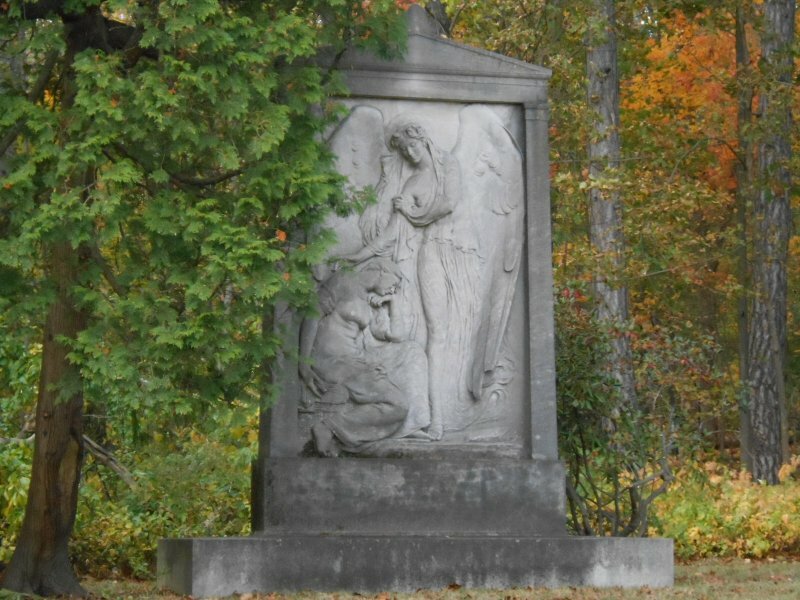 Arguably my favorite monument is the verdigris-bronze piece on the front of this stone monument arching up from the hillside. Who is buried here? What is the person’s past? Beliefs? to inspire such a powerful and eerie figure. She seems like a sybil spreading her capes in warning – or is she an embodiment of Death come to sweep down on us and enfold us in her flowing, boundless cape? I really need to do some research on the history of these wonderful works. 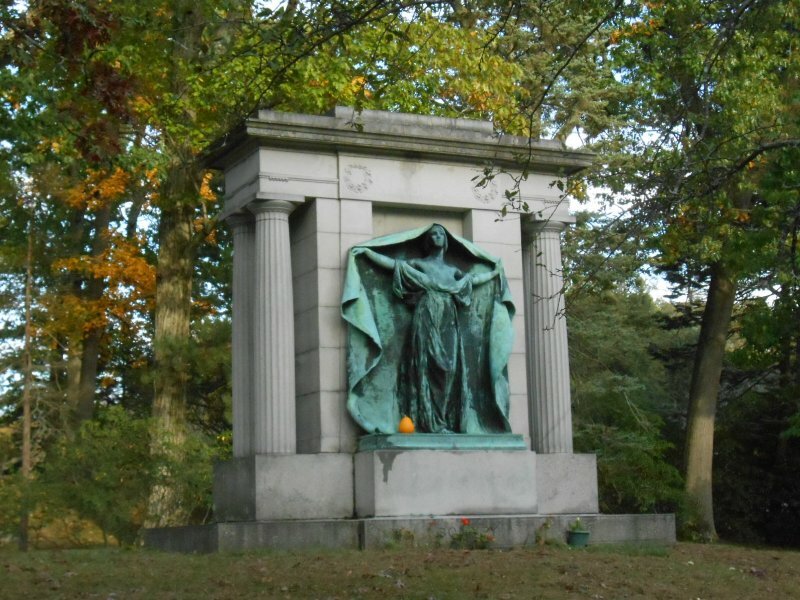 Are there any sculptures by famous or venerated artists in this cemetery? At any rate, she definitely deserves a close up. I have lots more photos to share, however, I don’t want you to succumb to cemetery overload. This is enough delicious melancholy for now. But don’t you think this place is so perfect a setting for parts of a Gothic novel? I already have some ideas “haunting” my brain. Anyway, I promise you another blog with more pictures soon.